Essaouira, 모로코의 시디 카우키 카사 알 벤트 | 호스텔월드에서 예약하세요. If you like art, this is your place to create calmly! 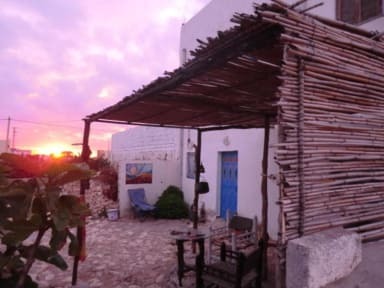 Sidi Kaouki Casa Al Vent is defined in 3 words: Simplicity, light and calm. We offer clean rooms with nice sea views just 500m from the beach. The 2 terraces provide the opportunity to relax or share experiences with other travellers. Far from cold hotel concepts, 'casa al vent' is a family run guesthouse where you have the possibility to use a shared kitchen with wash-machine, relax in the garden and meet our animals: Tafust, the donkey, Ben, the dog and our ducks, geese and chickens which provide farm fresh eggs for your breakfast. Artists, surfers and travellers enjoy the familiar atmosphere spend long periods here! You can have an ample breakfast (natural juice, salad, bread, omelette with vegetables, crepes, coffee....) in 'cafe al vent' in front of the beach with wonderful views! 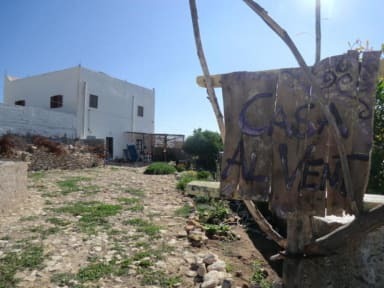 'café Al vent' wants to offer meals nearby the senses, where the ingredients are part of the daily life and landscape of Sidi Kaouki. Fish and seafood come from local fishermen who leave daily to work. Also our meat comes from chicken, goats and cows grazing freely in this lovely area, and vegetables are chosen according to the season, always prioritizing the closer ones. Besides you can eat paella with lobster in front of the ocean, or some tagine of Sidi Kaouki's goat, always accompanied by good music. Cancellation Policy: 1 day advance notice.